Notice: You may use this information your personal use or as a reference in your academic study. But reproducing, storing and retrieving this information in any form and for any other purpose is strictly prohibited. Hindu pantheon is very complex, organized and hierarchical. Without proper introduction into Hinduism, it is very difficult to understand the complexity surrounding the Hindu gods and goddesses and make sense of their numerous names, aspects, emanations and manifestations. The gods and goddesses belong to one large family of gods, headed by Supreme Brahman on one side as Purusha or Isvara and Para Shakti or Mother Goddess as His dependent or independent aspect on the other. Overtime, the pantheon of gods and goddesses underwent many changes, additions and deletions, resulting in further complexity. In the early Vedic period, the Vedic gods occupied a place of prominence, with Agni, Indra, Vayu, Soma, Varuna, Adityas, Maruts, Visvadevas, Brahma, Prajapati, Pusan, Asvins etc. playing a central role in the sacrificial rituals. The Brahmanas, Kshatriya, Vaisyas, who formed the original divisions of Vedic society, worshipped their own classes of gods. Individually, when the Brahmanas performed sacrifices for themselves in the domestic rites etc. they made offerings to their own gods. But when they officiated for the sacrifices where the Kshatriyas and Vaisyas were patrons or hosts of sacrifices (yajamanas) they made offerings to the gods their patrons worshipped. Thus in the Vedas you find invocations to numerous deities. The Kshatriyas worshipped gods of kshatra power, namely Indra, Varuna, Soma, Rudra, Parjanya, Yama, and Isana. The Brahmanas worshipped gods of Sattvic nature, namely Agni and Surya and later Adityas, or aspects of the Sun, chief among whom were Savitr and later Vishnu. The Vaisyas worshipped the gods of vis or commonality, namely Vasus, Rudras, Visvadevas and Maruts. The sudras worshipped, Pusan, an Aditya, and several local and village deities some of whom were outside the pale of Vedic tradition. These divisions of gods are stated in the Chandogya Upanishad (1.4.11-13). With the decline of the original Kshatriya clans, probably due to wars and internal squabbles, the worship of their gods declined and were replaced by the deities worshipped by a new class of rulers such as the Nandas, Mauryas, Sakas, Kushanas, Pahlavas, Barashivas, Kanvas etc. They hailed from different social and caste backgrounds, and worshipped different gods, some of whom were unknown to the early Vedic people and never mentioned in the early Vedic literature. Presently we have many gods and goddesses in Hinduism. Although numerically they were said to be hundreds and thousands, Hindus worship chiefly a few gods namely Brahma, Vishnu, Siva, Sarasvathi, Lakshmi, Parvathi, their manifestations, incarnations and emanations. Chief among the incarnations of Vishnu are Rama, Krishna, and Narasimha. His prominent image formations (arcavataras) are Lord Venkateswara, Ranganatha, Pandarinatha, Vittalnatha and Jagannatha. Prominent manifestations of Siva are Dakshinamurthy and nine Jyotirlingas. The goddesses also have various aspects. Prominent among the attendant deities are Lord Ganesha, Kumara, Nandi, Hanuman, Garuda. Apart from them, Hindus also worship many saintly persons such as Dattatreya, Chaitanya, Mantralaya Raghavendra Swami and Shirid Baba. This is well illustrated in a conversation between Yajnavalkya and Vidagdha Sakalya as quoted in the Brihadaranyaka Upanishad (3:9). When Sakalya asks how many gods are there, Yajnavalkya begins the conversation saying, "as many as mentioned in the offerings made to the gods of the universe, namely three hundred and three, three thousand and three." When Sakalya keeps on asking the same question, Yajnavalkya reduces the number to thirty three, then to six, then to three, then to two, then to one and half and finally to one. When asked who is the one, he replies that he is the immortal person (Self) who is in the body. Thus, in Hinduism the concept of one God acting as many or manifesting as many dates back to early Vedic period. One God manifests as many. He is the sum total of all things in the universe. That highest God of Hinduism is known as Brahman who is extolled in the Vedas as the Supreme Universal Self. He is both manifested and unmanifested, Being and Non-Being, Existence (sat) and non-existence (asat). According to the Paingala Upanishad, His reflection in the quality of sattva is considered Isvara, in Rajas Hiranyagarbha and in tamas Viraj. These three aspects, Isvara, Hiranyagarbha and Viraj are also identified with Vishnu, Brahma and Siva respectively in their roles as the preserver, creator and destroyer respectively. In the early Upanishads, such as Chandogya, Viraj is often described Death, for whom the entire creation is food. All the numerous gods and goddesses are the eyes, ears, hands and feet of Brahman only. In their individual aspects they represent diversity and His numerous duties (dharmas); but in their unified and highest aspect they represent Brahman, the Supreme Self. Thus Hinduism is neither monotheistic nor polytheistic, but represents elements of both. The following is a brief description of the numerous gods and goddesses of Hinduism, followed by a list of internal links that point to numerous articles explaining their significance and symbolism in Hinduism. Atman and Brahman represent two eternal realities ever present in existence. Their relationships is the subject matter of discussions in numerous schools of Hinduism. Following is a brief description of the two. Brahman: As stated already, Brahman is the highest God of Hinduism. He is supreme, universal Self who is eternal, indestructible and infinite, who is described in the Vedas as both manifested and unmanifested, and Being and Non-Being. He has numerous aspects. In the early Vedic descriptions He is often symbolized as the Sun. Those who attain liberation reach His world and become immortal by the northern path (Uttarayana). For more information on Brahman please check the links to Brahman found in the section on Brahman. For further information, you may also read my book Brahman. Brahman is not worshipped in temples or public places, but only internally. Atman: Atman is the individual Self. He is the lord of the microcosm (body). He is described in the Upanishads as the immortal, transcendental, imperishable Self, who cannot be reached through senses or the mind, but only in a non-dual state of self-absorption. Like Brahman, Atman is not worshipped in temples or public places, but only internally through concentration and meditation. Brahman, Vishnu and Shiva are the highest gods of Hinduism. These gods do not form part of the early Vedic pantheon. They rose to prominence subsequently, during the eastern and southern expansion of the Vedic religion in the Indian subcontinent. A brief description of the three deities is presented below. Brahma: Brahma is the creator god. He is originally known as Prajapati. He is the first born, father of the gods, humans and demons. He is also their teacher, who taught them about the nature of Self and the importance of virtue. He is also the revealer of the Vedas to the mankind. He has several mind born sons. In the early Upanishads and Vedic hymns he is credited with incarnations and described as the Cosmic Person (Purusha) as well as Isvara, Hiranyagarbha and Viraj. In some verses, he is also described as Prakriti or Nature. Brahma enjoyed an exalted position in ancient times, when the original Kshatriyas ruled the land. With their decline, his popularity declined. He is presently worshipped only in a few temples, mostly located in the areas, adjoining or forming part of the ancient Sindhu Saraswathi region, where the Kshatriyas ruled in ancient times. His abode is called Brahmaloka. Vishnu: He is currently the most popular god of Hinduism. Vaishnavism is also currently the most popular and dominant sect of Hinduism, with several sub sects and independent teacher traditions. Devotees of Vishnu worship Him as the highest supreme Brahman. In popular Hinduism he is considered the preserver responsible for the preservation and maintenance of creation. He goes by several names, such as Narayana, Adita, Padmanabha, Ananatasayana etc. He has also manifested upon earth as incarnations (avataras), manifestations (vyuhas), partial incarnations (amsavataras) and aspects such as Jagannatha, Panduranga, Ranganatha, Varadaraja, Venkateswara etc. India is dotted with numerous temples of Vishnu and His numerous aspects and incarnations. His abode is known as Vaikuntha. Shiva: In ancient times, Shiva was the most popular deity of Hinduism, worshipped in numerous form and diverse communities throughout the Indian subcontinent and even outside. While Saivism lost ground to Vaishnavism in the last century, it is still a very popular sect of Hinduism with dedicated followers. As in case of Vaishnavism, Saivism has several sects and sub sects. Followers of Siva worship Him as the Supreme Brahman who is responsible for the creation, preservation, and destruction of the worlds, besides delusion and liberation of the beings. In popular Hinduism he is considered the destroyer. He goes by several names such as Rudra, Ardhanariswara, Mahadev, Mahesvara, Isvara etc. He has also several aspects, manifestations, emanations and attendant deities. His abode is called Kailās. He is worshipped in the temples and households in his anthromorphic form and in the form of Sivalinga. In Tantra, he is also worshipped in the form of symbols. For more information on Shiva, please check our section on Shiva or visit our website Saivism.net as well as Allsaivism.com. Trimurthis: Brahma, Vishnu and Shiva are considered the Trimurthis, often translated into English as the Trinity of Hindu gods. In reality, they represent the triple functions of Brahman in creation. In their highest aspect, they are said to be the same, but different in their functional aspect, each ruling over a particular sphere and participating in creation along with their attendant deities. They are often compared to the Isvara, Hiranyagarbha and Viraj aspects of Brahman. Brahma is the reflection of Brahman in rajas, Vishnu in sattva and Siva in tamas. To know about their symbolism please check the links below. Shakti: The practice of worshipping Mother Goddess was in vogue in Indian since the Indus valley civilization. Shakti means energy. Hindus worship Shakti, also known as Mother Goddess, Divine Mother, Prakriti, Maya and various other names. In creation she represents the materiality and objectivity. Hence she is also known as the Field (kshetra). In the beings, she represents the mind and body. If Brahman is the instrumental cause of creation, Shakti is the material cause. If Brahman represents the will and consciousness, Shakti represents the numerous objects, worlds and beings in which the will and consciousness of Brahman remains hidden. In the Tantra tradition, Shakti is considered the highest supreme reality itself, with Brahman remaining in the background as the passive witness consciousness. In Vedic tradition she is a dependent reality, but in tantra she is independent. As the companion of Shiva, Shakti is worshipped in numerous temples across India. Saraswathi: Saraswathi is the goddess of knowledge and learning. She symbolizes our knowledge, virtue and creative intelligence. She is the consort of Brahma. As the source of knowledge, she is also the cause of knowledge, wisdom and liberation among the intelligent beings. She is responsible for refinement in speech, all artistic expressions and civilized behavior. Saraswathi means the flowing one. A river which flowed in the ancient past in the northwestern India is extolled frequently as Saraswathi. The civilization that thrived on the banks of the river and adjoining areas is known as Sindhu-Saraswathi civilization. The goddess is responsible for many crafts and skills. Some descriptions suggest hamsa or swan as her vehicle, while some mention peacock. She is usually depicted carrying a vina, an Indian musical instrument. Lakshmi: Lakshmi is the goddess of abundance who is responsible for health, wealth, luck and happiness. She is the consort of Vishnu. She was born in milky oceans during the churning of the oceans and gifted to Vishnu. She is usually depicted with four or two hands, either alone or in the company of Vishnu. When alone she is shown either seated in a lotus or standing in it, with elephants in the background. She goes by many names, the most popular being Sri. She incarnated several times upon earth along with Vishnu and participated in his duties as the preserver. Owl is described as her vehicle. She has numerous forms. Worship of eight forms of Lakshmi, known as ashta-lakshmis is a very popular Hindu tradition. Parvathi: Parvathi is the consort of Shiva and goddess of love, devotion, and destruction. She personifies numerous aspects of Mother Goddess and even equated with her in her role as the Mother of the Universe. She also figures prominently as Uma Haimavathi in the Kena Upanishad. She is also considered the second incarnation of Mother Goddess after the self-immolation of her first incarnation as Dakshayani or Sati. There are numerous shakti pithas installed in various parts of India to worship Sati. She goes by several names such as Haimavathi, Girija, Uma, Lalitha, Durga, Rudrani. She has both pleasant and fierce aspects. In some Puranas, she is described as the sister of Vishnu. In the images, she is depicted either alone or in the company of Shiva. In the Arthanariswra form, as Prakriti she is represented as one half of Siva, the Purusha. The Samhita portion of the Vedas contain hymns addressed to various gods, which are described below. Indra: Indra is the leader of gods, the lord of the heaven and the chief deity who figures prominently in the Vedas, with a quarter of the Rig-Veda Samhita devoted to his praise. The hymns extol him as a great warrior who slew his enemies including the demon Vrata and clipped the wings of mountains with his mighty weapon the thunderbolt. He is depicted in the Upanishads as the student of Brahma and teacher of Prataradana son of Divodasa. The white elephant Airavat is his vehicle and Indrani is his consort. By the time the Puranas were composed, this mighty god of the early Vedic period lost his prominence and was relegated to an inferior position. Agni: Agni figures prominently in the Rig-Veda, with the highest number of hymns addressed to him. They describe him as the highest god, priest, messenger, master of wealth, minister of sacrifice, dispeller of night and provider of wealth and progeny to the worshippers, who brings the gods to the sacrificial place. He manifests are fire upon earth, lightning in the mid-region and the sun in the highest realm. In the images he is depicted as an old man with two heads, three legs, a red body, pot belly, seven tongues, four horns and seven arms, each holding different objects with his consorts Svaha and Svadha on either side. The ram is his vehicle. In the body he personifies the digestive power. Vayu: Vayu is the wind god who is described in the Vedas as the lord of the mid-region and a great absorber. In the body he represents the breath. He rides upon a chariot drawn by a large number of horses, depending the upon and the intensity with which he blows. As an invisible deity he forms part of the subtle realm. He figures prominently in the hymns regarding Soma sacrifice. They describe him as a drinker of Soma and friend of Indra. In the images he is depicted as a blue colored god with four hands. Surya: Surya is the sun god, and one of the solar deities (Adityas). He is described in the Vedic hymns as the foreseeing one, a flying bird, a jewel in the sky, and the giver of light, with radiant hair who knows all that lives and who traverses the sky and the mid-region seeing all things that have birth, riding on a chariot driven by seven horses. He is also praised as a healer who cures the diseases of the heart and takes away the yellow hue. Savitr, to whom the Gayatri mantra is addressed, is an aspect of the sun before sunrise. In some hymns he is also addressed as Pusan. Varuna: Varuna is described in the Vedas as the god of rains, clouds, water, rivers and oceans. Some hymns beseech him for protection and forgiveness since he is the king and guardian of moral laws who keeps a close watch on the people and their actions with a thousand eyes. He knows the ways of men as well as the ways of gods. Some hymns also elevate him as the highest God who sustains the Asvattha tree whose roots are in heaven and branches below and who created a wide pathway for the sun to traverse the sky. In some hymns he is associated with Indra as Indra-Varuna, the guardian of men and in some with Mitra as Varuna-Mitra. In the images he is depicted as riding a crocodile or seven swans with four hands holding a conch, a vessel of precious stones, lotus and noose. Asvins: Asvins are twin gods who are well known for their healing ability and who are invariably invoked during sacrificial ceremonies since they always strive to do good to others. They are described in the hymns as divine physicians and surgeons well versed in the art of healing, surgery and even organ transplantation. They are rich in treasure, lords of splendor, having nimble hands, heroes, wonder workers and full of pleasantness, who bestow boons upon those who worship them and seek their protection. Aditi: Aditi is the prima mother of gods, especially the twelve solar deities known as Adityas, of whom Vishnu is one. She is a prototype of Mother Goddess or Prakriti, who is often compared in the Vedas to the sky and the space. The hymns suggest that she was born to Daksha and Daksha in turn was born to her. Although no specific hymns is addressed to her in the Vedas, she is mentioned in several hymns along with other gods as the might Aditi having the ability to grant the grace of Rudra. One hymn in particular describes Aditi as the heaven, the mid-region, the mother, the sons, all gods, five divisions of men and all that was born and shall be born. The Puranas describe her as the wife of sage Kashyapa and the mother of the Aditya, Indra and Vamana. Adityas: The Adityas are solar deities and sons of Aditi who figure in the hymns addressed to Visvadevas, Rhbus, Agni etc., and mentioned along with Maruts, Vasus, Rudras and other gods of commonality. They are described in the Rig-Veda as pure gods, lords of liberal gifts, free from blemish, who help the worshippers in prosperity, providing shelter, showing the way and in defeating their enemies. Surya is an Aditya but he does not figure in the list of Adityas. The Adityas were most likely aspects of the same sun, or the different suns who appear in the sky during the different hours of the day and given different names or identified with different deities. Many hymns of the Rig-Veda mention them collectively as Aditya without specifying their names. Some hymns even distinguish them from Indra, Vayu, Brihaspati, Mitra, Agni, Surya, Vishnu, Pusan, and Bhaga. In the Puranas their number went up from eight to twelve probably due to the division of time into twelve hours instead of seven or eight. The Vishnu Puranas lists the following 12 Aditya: Amsa, Aryaman, Bhaga, Dhuti, Mitra, Pusan, Sakra, Savitr, Tvstr, Varuna, Vishnu, Vivsvat. Usha: Usha is described in the Rig-Veda as the goddess of dawn, daughter of the sky, heaven's radiant daughter, auspicious goddess, opulent, and lady of the light with resplendent rays, who dawns upon people with prosperity and who graciously answers to the prayers with abundance and with brilliant light. Such descriptions suggest she may be even a precursor to Lakshmi, who also rises from the ocean like Usha. The Rig-Veda also describes her as the brightest and fairest, the sister of Savitr who wakes up people with sounds of joy and sends them great riches, who brings forth all the gods from the heaven so that they may drink the Soma. Yama: Yama means restraining one. According to the legends, he was the first to die and depart to the heaven. Subsequently, he became the lord of the underworld, Yamaloka. He is assisted in his duties by two fierce dogs with four eyes and wide nostrils who guard the path that lead the departed to his world. The Puranas describe him as the god death, and the ruler of southern quarter, who is known for his knowledge, judgment and fairness in punishing the sinners. They also describe the different kinds of punishments meted out to the sinner in his world according to the list of sins recorded by his assistant and record-keeper Chitragupta. Pusan: The Chandogya Upanishad describes Pusan as the god of the Sudras. In the Rig-Veda he is portrayed as a solar deity and a guardian of the world, who shines brightly in the sky, showing the way to people on earth as well as to the departing souls who are on their way to the other world. He is the wonder worker, who has goats for his steeds, who drives away from the path wolves, robbers, the wicked and the like, the lord of all prosperity and wielder of golden sword, who leads people to meadows rich in grass. Pusan is also associated with livestock as the vigorous one, who invigorates them by leading them to green pastures and protects them by helping men to find their lost cattle. In the Puranas he is described as one of the Adityas. Rudras: Rudra is the god of storms, who howls and roars, with shining body and braided hair, and wields the thunderbolt, bow and arrow. Although fearsome to look and wrathful, he is a benevolent god, repels the anger of gods and helps the worshippers. The Rig-Veda describes him as strong, bounteous, most excellent, and wise, with braided hair, who is the lord of heroes and ruler of valiant men, and who shines in splendor like the sun. He is an excellent physician and healer with thousands of medicines with which he cures the sickness of humans. He is often equated with Agni and later with Shiva. The Rudras are his attendant deities, whose number is mentioned as eleven in the Brihadaranyaka Upanishad. In the body, they are equated to the breaths and the mind. The Puranas mention eight Rudras, namely Bhava, Sarva, Isana, Pasupati, Bhima, Ugra, Mahadeva and Rudra. Maruts: Like the Rudras, the Maruts are also storm or wind deities of the mid-region who are often invoked along with Agni in the sacrifices to come together. They are described as the sons of Rudra and attendants and companions of Indra, who sit as deities in heaven above the mid-region's luminous sphere, and scatter the clouds. The Rig-Veda describes them as violent and aggressive with golden weapons, sons of Prisni, self-luminous, born together, bearers of spears, swords and glittering ornaments, fiercely vigorous and strong, who shake the heaven and earth like a garment. Their number vary fro 27 to 60. It appears that they were also invoked during war times to create unfavorable weather conditions and discourage the enemies from moving forward. Brihaspati: Brihaspati is the teacher of gods and a planetary deity equated with Jupiter among the planets. In the Vedas the role of teacher is originally ascribed to Prajapati, who is the teacher of not only gods, but also humans and demons. Hence, more likely Brihaspati may be an aspect of Prajapati in his role as a teacher. He is also often equated with Ganapati and Brahmanaspati. He is described in the Rig-Veda as the son of Angiras, sweet-tongued, mighty, leader of Samans, resplendent, whom both God and mortal listen and whose Samans pervade the earth and heaven. According to the Puranas, he was appointed as the teacher of gods by Shiva. He has rivalry with Shukracarya, the teacher of demons. He has three brothers and three wives. The three wives bore him nine daughters and nine sons. Vasus: According to the Brihadaranyaka Upanishad, the Vasus are eight in number. They are fire, earth, air, the mid-region, the sun, heaven, the moon and stars. They are so called because they the dwelling places for practically everything in creation. The Mahabharata mention the eight Vasus with their specific names: Dhara (the earth), Anala (fire), Apa (water), Anila (wind), Dhruva (the polestar), Soma (moon), Prabhasa (dawn) and Pratyusha (light). According to the Mahabharata due to a curse delivered by sage Vashista, the Vasus were born as the sons of Ganga. Of them due to the same curse, seven died instantly, while the last one survived and became renowned as Bhishma. Other gods: The other deities mentioned in the Vedas include Rtu, Savitr, Apris, Svanaya, Rbhus, Mitra, Bhavyaya, Aryaman, Indri, Saraswathi, and Brahmanaspati. Of them Saraswathi is the most important deity, who is mentioned frequently in the Rig-Veda and whom we have already described under the Shaktis as the consort of Brahma. Two gods figure prominently in Hindu pantheon as attendant deities of Vishnu, Garuda, Adisesha. To them we may also add Hanuman who played a prominent role in during the incarnation of Rama. Their importance is described below. Garuda: The Eagle shaped god, Garuda or Garutmanta, is the vehicle of Vishnu, whose images are found in Vaishnava temples as an associate deity of Vishnu or his aspects near or opposite the sanctum sanctorum. According to the Puranas, he is described as the son of Kashyapa and Vinata and brother of Aruna, the charioteer of Surya. Vishnu accepted him as his vehicle, impressed by his act of bringing the pot of nectar from Indra's heaven. In the images he is show part human and part bird with feature of both. He has a human body with wings and the head of an eagle. Garuda personifies humility, devotion and knowledge. Adishesha: Adishesha, is the serpent king who is also known as Shesha and Anantashesa. He is generally described as many thousand hooded serpent with a mass of coils floating in the waters of creation, upon which rests Vishnu and Lakshmi. In some images, he is also found with five or seven heads. Symbolically, he represents the materiality of creation. Since Vishnu rests upon him before, during and after creation, he is considered indestructible. According to the Mahabharata he was born to Kashyapa and his wife Kadri. He performed penances and earned the right to stay in the underworld (Patala) perennially to provide support to the earth. However, it is possible that this Shesha described in the Mahabharata, may be an aspect of the eternal Adisesha who carries Vishnu all the time. Hanuman: Hanuman is one of the most popular gods of Hinduism today. He is the son of Vayu, born with the powers and blessings of Shiva. He played a vital role in the Ramayana, assisting Rama in finding Sita and fighting on his behalf with the demons of Ravana. He has the features of a monkey, with a strong human body and heart of gold. He is known for his exemplary devotion to Rama and Sita. He also served as an emblem for the Pandavas during the Mahabharata war. He is worshipped in numerous temples across India and elsewhere. Hanuman Chalisa is the most popular prayer of Hanuman which are sung in millions of Hindu households and temples to invoke Hanuman and seek his blessings. One of the important beliefs of Hinduism is the incarnation of God in a mortal form upon earth from time to time to restore order and regularity. The duty of such incarnations falls upon Vishnu, who is the preserver. According to the Puranas, he has so far incarnated upon earth nine times and this tenth incarnation is yet to happen. The list of the nine incarnations vary. The following is the widely accepted list of Vishnu's incarnations upon earth. Each of these gods have different forms, characteristic features and temples and followers of them. Of them Rama and Krishna are the most popular and the incarnation of Buddha is a negative incarnation. Matsya. This is the incarnation of Vishnu as a mighty fish (matsya), in the Satya Yuga or the Age of Truth to save Manu, the father of mankind, the sages and the knowledge of the Vedas for the renewal of life upon earth, following a great flood. Kurma. This is the incarnation of Vishnu as a tortoise (kurma), in the Satya Yuga to support the mountain Mandhara and prevent it from sinking, when it was used by gods and demons to churn the oceans to obtain Amrita or the elixir of life. Varaha. This is the incarnation Vishnu as a boar, again in the Satya Yuga to save the earth from destruction when the demon Hiranyaksha submerged it under an ocean. Assuming the form of a boar, Vishnu lifted the earth and saved the mankind. Narasimha. In this incarnation, which also happened in the Satya Yuga, Vishnu assumed the fierce form of a man-lion with a human body but the head of a lion, to save Prahlada, his devotee, from the oppression of his father Hiranyakasipu who was displeased with son's devotion for Vishnu. Vamana. In this incarnation which happened in the Treta Yuga, Vishnu assumed the form of a dwarfish Brahman boy to slay Bali, a noble but demonic king, who defeated Indra and occupied the heaven. After obtaining permission from Bali to secure a space equal to three steps for himself, with two strides he covered the whole universe and with the third he pushed Bali into the underworld. Parashurama. In this incarnation during Treta Yuga, Vishnu was born as the son of Brahmana couple, Jamadagni and Renuka, but assumed the duties of a warrior to destroy the entire Kshatriya race as they had become tyrannical and fallen into sinful ways. This incident probably alludes to a conflict between Kshatriya and Brahmanas, and the subsequent decline of the Kshatriyas, which was discussed before. Rama: In this incarnation again during Treta Yuga, which is well described in the epic Ramayana, Vishnu was born as the warrior prince Rama with a specific purpose to slay the ten-headed demon king Ravana, who had become invincible due to a boon obtained by him from Shiva. In this incarnation he was assisted by his brother Lakshmana, who is considered an incarnation of Adisesha, and by Hanuman, the son of Vayu. Krishna. In this incarnation which happened in Dwapara Yuga, Vishnu was born as the younger brother of Balarama, who is also described in some accounts as an incarnation of Vishnu to restore order as the earth was troubled by numerous demons and evil beings. He played a key role in the Mahabharata war and because a household name for his exploits and his teaching of the Bhagavadgita, which he delivered to Arjuna in the middle of the battlefield. Buddha. The incarnation of Buddha figures only in certain accounts. In others it is ascribed to Balarama. Where it is included, it is described in negative terms. According to one version, in this incarnation which happened during Kali Yuga, Vishnu was born as Buddha, with a specific mission to mislead the demons who were born as atheists and non-believers and cause their downfall and destruction by preaching them the philosophy of no-soul and no God. Kalki. In this incarnation, which is expected to happen at the end of Kali Yuga or the Age of Darkness, Vishnu will incarnate as a fierce warrior. Riding upon the back of a white horse and carrying a sword, he will destroy the sinners and the wicked ones to restore Dharma and herald the dawn of a new golden age. The minor or partial incarnations of Vishnu are known as amsavataras, meaning only specific aspects of Vishnu manifest in the deities who appear upon earth to perform certain specific tasks as part of preservation and continuation of creation and dharma. Sometimes, going by the definition, the incarnations of Balarama and even Rama are included in this list. The most notable among the partial incarnations of Vishnu are Dattatreya, Dhanvantari, Hayagriva, Kapila, Mohini, Nara-Narayana, Vyasa and Yajna. A brief description of each is provided below. Dattatreya: Born to Atri and his wife Anasuya, Dattatrreya is regarded as a human manifestation of the combined power of the trinity, teacher of non-Vedic people and originator of certain magical rites and Soma rituals. He is always accompanied by four dogs, which represent the four Vedas. Dhanvantari: Dhanvantari manifested from the waters during the churning of the oceans, holding the pot of Amrita. He is credited with the knowledge of the medical sciences and healing among the gods. Subsequently, he was born as a king of Kasi and reintroduced the same knowledge to the people of the earth. Hayagriva. He is associated with the knowledge of Yajurveda, which he received rom Surya, after performing a severe penance. The knowledge he gained thus forms part of the Vajasaneyi Samhita. According to some version, Lord Vishnu was born as Hayagriva to rescue the Vedas from two demons, Madhu and Kaitabha when they stole them. In the images, he is shown with the head of a horse, having four or eight arms, holding several weapons and objects in them. Kapila: He is credited with the authorship of Kapila Sutras and the founding of the Samkhya school of philosophy. According to the Puranas, he was instrumental in the coming down of the Ganga from heaven to the earth, since it was he reduced the children of Sagara to ashes, where upon Bhagiratha performed a great penance to bring them back to life. He is said to be the son of Kardama and Devahuti. In the images he is depicted as an ascetic with knotted hair, long beard and four arms. Mohini: During the churning of the oceans, when the pot of elixir finally manifested, it became necessary for Vishnu, at the behest of gods, to appear as a beautiful maiden and delude the demons to prevent them from partaking the elixir and instead opt for an intoxicating drink. So beautiful was the form of Mohini that even Shiva was overcame with feelings of love and infatuation. Nara-Narayana: Nara and Narayana are described as two sages who were born to Dharma and Ahimsa. They performed a great penance to destroy Sahasrakavaca, the demon of a thousand armors. Later they said to have taken birth as Arjuna and Krishna respectively. According to another version, at the end of the incarnation of Narasihma, his body was split into two. The human part became Nara and the lion part became Narayana. Then they performed a great penance, during which Indra sent celestial nymphs to tempt them. Narayana then produced Urvasi from his thigh, who was much more beautiful than all of them. Symbolically, Nara-Narayana represent the relationship between man and God. Vyasa: Sage Vyasa, also known as Krishna-Dvaipayana, is credited with the authorship of several scriptures, which include the Vedas, the Mahabharata, all the Puranas and the Brahmasutras. He is also credited with the composition of the Bhagavadgita since it forms part of the Mahabharata. He was said to be the son of sage Parasara. In the images he is depicted as a sage with long hair knotted into a crown and long beard with his four disciples by his side. Yajnesa: Yajna, Yajnesa or Yajnesvara is the lord of the sacrifice. The whole manifestation happened because of a sacrifice and Vishnu is its sacrificer, sacrificed and object of sacrifice. Hence, the various limbs of the deity are compared to various parts of a sacrifice. According to the Puranas, Yajnesa was born to Ruci and Akuti. In his images he is shown with two heads, seven hands, three legs and four horns, suggesting his affinity with Agni. His hands hold various objects used in a sacrifice. According to Vaishnava tradition, five classes of manifestations are attributed to Vishnu, namely transcendental (para), emanating (vyuha), incarnating (vibhava), the hidden (antaryami) and image forms (arca). Of these we have already discussed the transcendental and incarnating aspects of Vishnu. Of the remaining, the hidden aspect is considered the Supreme Self who resides in the heart of a being, apart from the individual Self, as its eternal companion. Arca constitute the living and breathing images and sacred symbols which embody of Vishnu and which are used in human worship. Finally, the Vyuhas are the emanations of Vishnu, which are four. Together they are called caturvyuhas or caturmurthis. They are usually associated with Krishna who is also known as Vasudeva. Of the four, the first one emanates from the transcendental Vishnu. The second one from the first, the third one from second and so on. The four deities also undergo change from epoch (yuga) to epoch as indicated by the changes in their colors. Symbolically the four emanations represent the internal organ. Vasudeva represents the consciousness (citta). Samkarshana stands for ego. Pradyumna for intelligence, and Aniruddha for the mind (manas). They also represent the fours state of consciousness, wakefulness, dream state, deep sleep state and transcendental state. In some accounts, Vasudeva is equated with Vishnu or Para Vasudeva, since both possess six qualities, and the Vyuhas are counted as three. The four Vyuhas are described below. Vasudeva: He is identified with Sri Krishna, endowed with six supreme qualities, namely knowledge (jnana), power (Shakti), strength (bala), lordship (aisvarya), virility (virya) and light (tejas). Those who attain liberation are able to enter into his presence and experience supreme bliss at the mere sight of him. Samkarshana: He emnates from Vasudeva and is endowed with knowledge and strength. He introduces the knowledge of the scriptures and destroys the universe in the end. He is also identified with Balarama. Pradyumna: He represents strength and lordship. He is the creator who manifests the universe and the Dharma. Aniruddha: He represents virility and light. He is protector of the world and exponent of dharma. Vyuhantaras: The four emanations later manifest as 12 further emanations called Vyuhantaras, three from each Vyuha. They are: Kesava, Madhava and Narayana from Vasudeva; Govindha, Vishnu and Madhusudhana from Samkarshana; Trivikrama, Vamana and Sridhara from Pradymna; and Hrisikesa, Padmanabha and Damodara from Aniruddha. Each of these deities, just as the Vyuhas are used in meditation by the devotees of Vasudeva. According to Vaishnava tradition, Vishnu also manifested in the mortal world in the form of images and symbols called Arcavataras. They are the living images of God. Unlike the incarnations, which happened once and the Vyuhas which are abstract and beyond the reach of the perceptual world, the Arcas are the permanent incarnations of Vishnu which are within the reach of the senses and part of our existence. Since the transcendental power of God manifests in these objects of Nature, they carry a powerful presence of God having the ability to fulfill the wishes of His devotees. The Arcavataras are divided into four kinds: self-manifested (svayamvyakta), established by divine beings (divya), installed by seers and sages (arsha), and installed by human beings (manusa). Of them the first category are the most potent. The images installed in the temples at Srirangam, Tirupathi, Puri, Kanci etc. come under the first category. In the last category are the images installed in households and numerous local temples. These images gain mystic powers to the extent they are worshipped and made offerings. Worship of the images is considered equal to the worship of God since they embody the presence of God and are considered the living and breathing images of God. Hence, in the temples they are served with utmost devotions with honors due to a king or a person of great importance. Although in popular Hinduism, Shiva is considered the destroyer and part of the Trimurthis, in Saiva tradition he is considered the highest Supreme Self and Brahman Himself. As the lord of the universe (Isvara) He assumes numerous forms. He also goes by numerous names, some representing Shiva himself and some his manifestations. Although, in Saivism there is no concept of incarnation, Saivaites recognize numerous aspects of Siva, some of which are his functional aspects and some represent his independent manifestations. As the lord of the universe, Siva carries out five different functions: creation, preservation, concealment, revelation and destruction. Each of these are represented as a deity. Apart from them there are several other aspects of Shiva which are principally categorized into pleasant, (saumya), fierce (ugra), dancing (nrtta or tandava) etc., which will be discussed below. The following are important aspects of Shiva. Pancanana: As stated before, Siva carries out five specific functions in creation. Each of his functional aspects manifests as an independent deity. The five gods associated with his five functions are Sadyojata, Vamadeva, Tatpurusha, Aghora and Isana. Sadyojata is the creator who brings forth the world and beings. He is comparable to Brahma. Vamadeva is the upholder and preserver of the worlds whose functions are similar to that of Vishnu. Tatpurusha is the lord of concealment who obscures the reality of existence. He is responsible for the darkness, ignorance and delusion of beings. Aghora represents the destructive nature of Shiva. He participates in the destruction and renewal of objects and worlds. Isana is also known as Sadasiva. He is the liberator. in the images the pancanana Shivas are depicted together, each deity facing a particular direction. Thus Sadyojata faces west, Vamadeva north, Tatpurusha east, Aghora south and Isana, either sky or northeast. Saumya murthi: Shiva has several pleasant aspects, in which he showers grace upon his devotees and grants them boons. They include those forms in which he offered protection (abhaya) or fulfilled the wishes of his devotees in the past, such as Ravana, Candesa, Amba, Nandisvara and Vighneswara. He is usually found in these forms in the presence of his consort Parvathi, Ganesha, Kumara, and Nandi and when he appears before his closest and dearest devotees who perform penances for him and show exemplary devotion. Ugra murthi : Usually, Shiva assumes terrible forms to slay the troublesome demons or restore order. The demons he slew in the past include those to whom he might have granted boons in his pleasant mood. Since, he cannot slew his own devotees in a pleasant form, he assumes fierce forms to accomplish the duty. His fierce forms include Bhairava, Veerabhadra, Gajasuravadha-murthi, Tripurantaka-murthi, Sarabha, Kalari-murthi, Kamantaka-murthi etc. Nritta-murthi: Shiva is a master of dance and originator of 108 dance forms. He dances in order to relieve the beings from suffering and to ensure the order and regularity of the world. Through his dance he sets in motion numerous vibrations which are vital to the continuation of the worlds. The dance also symbolizes his role as the destroyer of the world. Among his dance forms, Nataraja is the most well known. with great symbolic significance. His other dancing aspects mentioned in the Agamas are Ananda Tandava Murthi which he manifests when he dances with ecstasy, Uma Tandava Murthi which appears when dances with his consort and Tripura Tandava Murthi which appeared when he was engaged in fierce battle with Tripurasura. Other aspects: Shiva is also revered as the master of yoga (Yogisvara), Hari-Hara also known as Haryardhamurthi, Ardhanarisvara, universal teacher (Dakshinamurthy), wandering ascetic (Bhikshatanamurthi), and he who manifested from the linga (lingodvhavamurthi) to prove his superiority in a contest with Brahma and Vishnu. Of these Ardhanariswara (half man and half woman) represent Purusha (Shiva) and Prakriti (Parvathi) as the dualities or twin realities of Shiva in his role as the lord of the universe. In the images, Parvathi appears on the left side and Shiva on the right side. Ganesha: He is the son of Shiva and lord of obstacles, who goes by several names such as Ganapati, Vinayaka, Gajanana, Vighnaraja, Vakratunda etc. He is one of the most popular gods of the Hindu pantheon, who is invariably worshipped in all rituals before offerings are made to other deities. He enjoys this exalted position because he is considered the leader of the gods and the first among them. He has a rather unusual forms due to the circumstances related to his origin. He has an elephant head with a rather oversized human body, with four or more hands. He is considered god of knowledge and wisdom and often equated with Brihaspati or Bahmanspati, the teacher of gods, mentioned in the Vedas. There is a sect of Hinduism, called Ganapatya sect, in which he is worshipped as Brahman himself. He has numerous aspects, some pleasant and some fierce. Sometimes, he is shown in the company of his consorts, Riddhi and Siddhi and sometime in the company of Lakshmi as Lakshmi Ganapati. There are numerous temples built in his honor in various parts of India. Kumara: He is the eldest son of Shiva, who goes by different names as Kumara Swamy, Mallikarjuna, Kartikeya, Shaktidhari, and Muruga. He is much older deity than Ganesha and depicted in some of the ancient coins of the Kushanas. He was born with a specific purpose to slay the demon Tarakasura. A number of legends are associated with his birth and early exploits. He was brought up by six mothers. When he grew up, he became the commander-in-chief of the Siva ganas. Peacock is his vehicle and sword is his weapon with which he slew Tarakasura. Valli and Devasena, the daughter of Indra, are his consorts. He is also a god of virtue, who practices celibacy, likes the company of Brahmanas and helps people grow spiritually. In the images he is depicted in the company of his vehicle peacock usually with one head and two arms and at times with six heads and twelve arms. Ayyappa: He is also known as Sasta, Arya and Hariharaputra and in some versions considered Kumaraswamy or an aspect of him. According to one legend, he was born to Shiva and Hari, when the latter assumed the form of Mohini and Shiva became infatuated with her. According to another version, after the death of Mahisasura, his wife Mahisi obtained a boon from Brahma which made her invincible. Shiva and Vishnu then came together to create her destroyer in the form of a baby. He was brought up a king named Rajasekhara in Kerala, who named him Manikanthan. When he attained the age of 12, he killed Mahisi. Later he said to have disappeared after advising his father to build, which subsequently became renowned as Sabarimalai temple. It is currently one of the popular pilgrim places of Hindus. Devotees who want to visit the temple on a ritual pilgrimage observe 41 days of penance before paying him a visit. Nandi: Nandi serves as the vehicle of Shiva and occupies an important place in the Saiva Pantheon, next only to Ganesha and Kumara. Although he has the form of a bull, he is a god of knowledge and wisdom, born by the grace of Shiva to Silada, who later gifted him to Shiva. He served as the teacher of 18 adepts (siddhas) including Patanjali and Thirumular. He also participated in several wars along with Shiva or on his own, mostly to help the gods and save them from demons. The images of Nandi are invariably found in all Shiva temples. His anthromorphic forms are also found in some temples. There are several temples, which are solely built for him. Large Nandi statues are found at several places in India such as Lepakshi in Andhra Pradesh and the one on Chamundi Hill near Mysore, in Karnataka. He is worshipped in some places as a fertility god. In Saiva temples, his images are usually installed in front of sanctum sanctorum within the visual range so that deities can see Shiva directly by looking over his head just as he would appear to him. Bhringi: He is a sage who is described as one of the most ardent devotees of Shiva, who upon achieving liberation became a part of Shiva's retinue. He is so single-minded in his devotion to Shiva that once when he saw Shiva and Parvathi together in the form of Arthanariswara, he became a bee and tried to circle around Shiva only by trying to bore through the middle of their joint form, much to the annoyance of Parvathi who cursed him to become deprived of flesh and blood whereby he became a mere skeleton without flesh and blood and unable to stand. Shiva took pity on him and gave him a third leg. Bhringi then realized his mistake and decided to worship them both. In the images, Bhringi is shown as having three legs usually in the company of Shiva or Parvathi. His images are found only in a few temples. He and Nandi are often shown as doorkeepers (dwarapalakas) in Shiva temples. Chandesvara: He is another important devotee of Shiva who invariably appears in the north eastern corner of Shiva temples as an attendant deity. Since he is considered a messenger and mediator who can plead with Shiva on behalf the devotees who approach him, devotees go to him with their prayers and supplications. Unlike Bhringi, he is a fierce deity, who holds various weapons in his hands suggestive of his warrior background. As stated already, Shakti is the materiality of the universe. She is the Isvari principle, which is eternal, independent and dynamic. In some traditions she is depicted as a dependent reality. Symbolically, she represents the field of experience, objectivity, Nature and its aspects, and manifestation itself. She has both gross and subtle aspects. She is inseparable from Purusha and well represented in the Ardhanariswara as an equal and supreme aspect of existence. Like Brahman, she has both manifested and unmanifested aspects. Even modern science acknowledges that the universe can be boiled down to eternal and indestructible principles, space and energy. In Hinduism pure consciousness objectified as space represents Purusha and energy objectified as matter and materiality represents Shakti. Their combination is Brahman, existence itself. Just as the highest gods of Hinduism manifest variously and just as they are worshipped numerously, Shakti or Mother Goddess has also numerous aspects and is worshipped in various ways. One of the earliest references to energy manifesting itself variously is be found in the Mundaka Upanishad which distinguishes seven kinds of flaming fire and refers to them as "Kali, Karali, Manojava, Sulohita, Sudhumravarna, Sphulingini, and Visvaruci." Some of these names later appear as manifestation of Shakti. Aspects of Saraswathi: Although Saraswathi is one of the oldest deities of Hinduism, we do not have much information about her aspect. In the Rigveda she was worshipped as a river goddess. But she became more popular as the goddess of learning. She has numerous names, such as Sarada, Bharati, Brahmi, Vidyadhari, Vedavathi and in all these her association with various branches and aspect of learning is self-evident. We may symbolically say that just as there are numerous branches of knowledge and forms of learning, Saraswathi also has numersou aspects. However we have no information that she was worshipped in all those forms. As the Mother of all knowledge and as an aspect of Maya, she has three basic forms. As the reflection in tamas, she manifests as Avidya (ignorance). As the reflection in rajas, she manifests as Vidya (lower knowledge of worldly knowledge), and as the reflection in sattva, she manifests in us as Paravidya (transcendental knowledge). Aspects of Maha Lakshmi: Just as abundance has various forms, Maha Lakshmi has several names and aspects. As the Mother of all abundance and consort of Vishnu, she also manifests variously in creation, sometimes as part of Vishnu's duties as preserver and sometimes on her own. Of her numerous forms eight are the most prominent, known as Ashta Lakshmis, namely Adi Lakshmi, Dhanya Lakshmi, Dhairya Lakshmi or Sahasa Lakshmi, Gaja Lakshmi, Santana Lakshm, Vijaya Lakshmi, Vidya Lakshmi, and Dhana Lakshmi. Apart from these, Lakshmi also manifests in either other forms as the corresponding eight aspects of Vishnu. They are: Sridevi, Bhudevi, Sarasvathi, Priti, Kirti, Santi, Tusti and Pusti. They represent the eight supreme abundancew of Vishnu as Bhagavan. Lakshmi also has an opposite aspect or a negative aspect, called Alakshmi, who is sometimes mentioned as Bhudevi or Jyesthadevi, the goddess of suffering, adversity and forbearance. While Alakhmi may not give you wealth, if you pray to her, she gives you the fortitude to bear with pain and suffering. In addition to these, Lakshmi also has incarnated upon earth in the past as part of Vishnu's incarnations. Of them Varahi, Narasimhi, Sita and Rukmini are the most popular. Aspects of Maha Devi: Parvathi, the consort of Shiva, also has numerous aspects both as Maha Devi (or Parvathi) and as Isvari, or the Divine Mother. Just as the seven forms of fire mentioned before, the Devi appears in creation as seven mothers (sapta matrikas), namely Brahmi, Mahesvari, Kaumari, Vaisnavi, Varahi, Narasimhi (or Chamundesvari) and Aindri. As the names suggest these deities are the corresponding energies of Brahma, Shiva, Kumara, Vishnu, Varaha, Narasimha and Indra. Just as theri names, in the images they bear the same distiguishing features as their male counterparts, carrying similar weapons and objects in their hands and using the same vehicles. They also have a symbolic significance in the spiritual realm, since each of them represents a particular spiritual aspect of the Devi and facilitates the self-transformation and spiritual growth of a devotee in different stages. The Tantras mention ten aspects of Devi, called Dasamavidyas. Vidya means knowledge. Hence, as the name suggests, they represent ten different types of liberating knowledge and the power that acts as their source. They are, Kali, Tara, Sodasi, Bhuvanesvari, Bhairavi, Cinnamasta, Dhumavathi, Bagala, Matangi, and Kamala. Of these some are pleasant forms and some very fierce and destructive. Some have altenate names and are identified with other goddesses. For example, Dhuma is identified with Alakshmi and Kamala with Lakshmi. Apart from Parvathi manifests in other forms, namely Durga, Mahisasura-Mardini, Mahakali and Lalitha. Foremost among them is Durga, who is prominently described in the Devibhagavatam and who goes by different names as Chandi, Devi, Yogini, Vindhyavasini, Bhramari etc. She rides a lion or a tiger as her vehicle and has both pleasant and fierce forms. In Hindu pantheon, she is as popular as the main aspects of Shakti. Mahisasura-Mardini manifested from the combined power of Brahma, Vishnu and Shiva to slay the demon Mahisasura. She personifies numerous perfections. The same Devi manifested again as Kausiki Durga who became popular as Kali or Mahakali. She is the embodiment of Parvathi in Tamas. She slew several demons and restored order. She is of fierce form and worshipped in numerous temples according to both Vedic and Agamic traditions. Lalita or Lalita Tripurasundari is another famous aspect of Parvathi, who is worshipped in several parts of India, especially south. Devotee worship her extolling her virtues and chanting her numerous names, using prayers such as Lalita-Sahasra- Namam, Khadga-Mala-Stotram, Lalita-Tristari-Naman, Panca-Dasa-Akshari, Lalita-Pratastavam etc. They also worship her using her graphic representation (yantra) called Sricakra. The Devi has too many aspects to specify in this general presentation. There are numerous temples, sacred places, and village deities in India who are identified and worshipped as aspects of Devi. We will end this section by naming a few of her remaining aspects, which may be categorized as minor aspects. They are Annapurna, Aparajita, Aparna, Bala, Bhadrakali, Brahmini, Bhutamata, Camunda, Gayatri, Indrakshi, Jagadhatri, Kamesvari, Kanaka Paramesvari, Katyayani, Manonmani, Rajarajesvari, Sivaduti, Tripuresvari, Yogini etc. Hindus also worship planetary gods called Grahas and rules of directions called Dikpalas. Their details are mentioned below. Navagrahas: Hinduism believes in both free will and fate. While the individuals are responsible and accountable for their actions, they are also subject to chance, the actions of others, Nature and God. One of the beliefs in Hinduism, which is central to Vedic astrology is the belief in the influence of planets, according to which the arrangement of planets and their position at the time of birth and also during the course of one's life carry a great influence in shaping that person's life. Hinduism recognizes nine planetary gods, called Navagrahas, namely Surya, Soma or Chandra, Mangala, Budha, Guru, Sukra, Sani, Rahu and Ketu. Of them the first seven are gods, while last two are demons, who along with Sani cast a negative influence upon people when the planetary gods are not properly aligned. The seven days in a week in the Hindu calendar. are also named after the seven gods. Although these gods not exactly the same as the planets in the Solar systems, they are identified with some planets. Thus Surya is the Sun, Soma is the Moon, Mangala is Mercury, Budha is Mars, Guru is Jupiter, Sukra is Vensu, Sani is Saturn. Each of these gods have their own distinguishing features, vehicles, weapons and significance in Hindu pantheon. The images and statues of the nine gods are installed together in most of the Hindu temples on raised platforms, which people circle while praying to them. There are also some temples exclusively dedicated to them. Ashta Dikpalas: The Dikpalas are rulers of directions (dik). Directions play a prominent role in Vedic tradition, since they denote the infinity and extent of the Cosmic Self, Purusha who is spread in all directions. In the body the legs personify direction. The eight directions of the Cosmic being, who is usually described as four footed are mentioned in several hymns and verses of the Upanishads. For example one verse in the Brihadaranyaka Upanishad (1.2.3) compares the head of four footed Brahman in the form of a hores with the eastern direction, arms with northeast and south east, tail with western direction, two legs with southwest and northwest, sides with southern and norther directions, with the sky as his back, the mid region as his belly and the earth as his chest. The directions also play a vital role in the journey of the departed souls after they die. The directions assumed greater importance in the later Vedic period with the emergence of temple building and Vastu sastra. It was believed that each direction in the space was ruled by a particular Vedic deity, who was originally identified as a god of Kshatra power. Thus in Hinduism, eight rulers of space or directions are identified, four for the main directions and four for the intermediary directions. Indra, Varuna, Kubera and Yama are the rulers of the four main directions, namely east, west, north and south respectively. Agni, Niruthi, Isana and Vayu are the rulers of intermediary directions, namely south-east, south-west, north-east and north-west respectively. The importance of these deities has already been explained under the section Vedic deities except for Kubera, who is an Yaksha and god of wealth and Niruthi, the chief of demons, with certain divine qualities. Apart from the main deities and minor deities, Hindus also worship several local deities, village deities, serpents, trees, rivers, mountains, animals, spirits, ancestors. 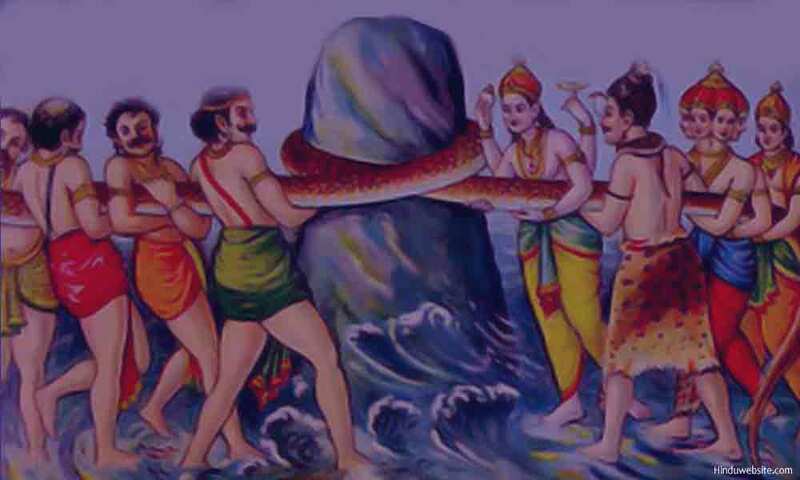 Serpent worship: Serpent worship is very common in various parts of India. Images of serpents are found in most Hindu temples. Women worship both live serpents located in their natural habitats in sacred places or under sacred trees or they worship images and status of serpents in temple premises, seeking boons, to ward off evil or for children. Tree worship: Among the trees Hindus consider Banyan tree, Pipal tree and Bulrush tree worthy of worship. The older the tree the greater the faith. Their location is also important. Trees that are located on the banks of sacred rivers and streams or located in temples or near the images of imporant deities attract wider attention. River worship: Hindus also worship many rives. Rivers such as Saraswathi, Ganga, Yamuna, Narmada, Kshipra, Brahmaputra, Godavari, Krishna and Kavery are considered sacred and worshipped on auspicious occasions. It is also customary for people take a dip in these rives and make offerings to gods and ancestors using the river water either standing in the river or on the banks of the such rivers. Mountain worship: Worshipping mountains and hills is a very ancient practice in Hinduism. Many Hindu temples are located on the hill tops and in the mountain ranges. Most well known among them are the Tirumala hills, Arunacala Hill, Chamundi Hill, Mount Kailash etc. People worship them either by making a parikrama (circumambulation) around them, offering prayers to their presiding deities or by visiting the temples located on them. Worship of ancestors: Currently ancestral worship is practiced only on a limited scale in certain communities located in parts of Kerala, Tamilnadu and Bali in Indonesia. However, Hindus make offerings ritually as per tradition on memorial days to their ancestors to ensure their continuity and wellbeing in the ancestral world. It was customary in the past for the Rajput princely families in central and western India to build temples for their ancestors and worship them. Some of these temples can still be found in places like Indore and Jaipur. Worship of saints and seers: In Hinduism a liberated person (jivanmukta) is equal to a god or divinity. An enlightened person is God in human form and worthy of worship. Since ancient times, Hindus have been worshipped saints and seers who achieve liberation or spent their lives in the service of God. Most prominent among them are Alvars and Nayanars, several teachers such as Valmiki, Patanjali, Vyasa, Agastya, Sankaracharya, Ramanujacharya, Gorakshanatha, Basavanna, Mirabai and Sri Raghavendra of Mantralayam. Mention may also made of Ramakrishna Paramahansa, Ramana Maharshi, Shirdi Saibaba, Paramahansa Yogananda, Swami Sivananda Saraswathi and Bhagavan Nityananda (of Siddha Yoga Tradition). These gurus may not be worshipped by everyone, but their close followers and those who believe in them worship them with great faith. Worship of symbols and sacred objects: Several Hindu gods are not only worshipped in their anthropomorphic form but also as objects and symbols. We have already explained the importance of image as a living symbol of God in Hinduism. Some of the important symbols and objects worshipped by Hindus on specific occasions or part of their rituals offerings include, Poorna Kalasa which symbolizes fertility, auspiciousness and Divine Mother, Shivalinga which symbolizes Shiva and Parvathi in close embrace, Salagrama which symbolizes Vishnu, images of footprints attributed to deities or saintly persons, ornaments adorning the deities in temples, vehicles of gods and goddesses, domestic animals, chariots used in the temple rituals, elephants associated with temples, sacred diagrams (yantras) drawn on the temples walls or on the ground, conches, and objects temporarily made of sandal paste, clay or balls of rice. Thus one can see that Hindus worship literally everything, from heaven to earth, the sun, moon, stars, the five elements, the human body, the sacred Self and practically the entire universe. Hindus venerate the entire creation as one and many. They acknowledge not only its diversity and duality but also its unity. The numerous divinites worshipped in Hinduism are the manifestations of one Supreme Self. The same God finds Himself in the numerous forms and modifications of Prakriti. Every deity worshipped in Hinduism is an aspect of Brahman and represent Brahman only in its ultimate aspect. The same approach justifies the fundamental belief of Hinduism that one can reach God through any deity and any path one may chose, as long as the goal is to reach Brahman only or the highest supreme, indivisible and indestructible reality. The following internal links provide information on various popular gods and goddess of Hinduism. The articles on Vishnu and avataras explain the significance of reincarnation of gods and why gods reincarnates upon earth from time to time. The article on Vedic pantheon provide brief descriptions of popular Vedic gods and goddesses such as Indra, Varuna, Agni, mitra and Soma. In the Hindu pantheon FAQ you will find the reasons why Hindus worship popular gods and goddesses, how they are worshipped and whether idol worship, which a popular practice among the Hindus, is justified. 1. An Advanced History of India, by R.C.Majumdar, H.C.RayChaudhuri, Kalikinkar Datta. Gratitude: The information for this article has been collected from various sources. However, I would like to acknowledge one important source, which proved very valuable to me in presenting this exhaustive information: Hindu Gods and Goddesses by Swami Harshananda, Published by Sri Ramakrishna Math. If you are a Hindu, this book is worth buying and reading to know your gods and goddesses and their significance in your life and meditative practices.